The Apple Watch Series 4 has been out for a while now, but there’s still no sign of the hyped ECG feature the company had promised. Last we heard, it’s supposed to arrive before the end of the year. Now a new report claims that it’ll be activated in the watchOS 5.1.2 build. Before you get too excited, you should know that watchOS 5.1.2 is currently in beta testing and isn’t officially available yet. It’s been in testing since November 7 though, so the public rollout shouldn’t be too far off. MacRumors dug out this scoop via an internal Apple Store training document which tells staff how to deal with people having questions about the ECG tool. It seems watchOS 5.1.2 has a dedicated ECG app to tell you if you have an atrial fibrillation (irregular heart rhythm) or normal sinus rhythm. The Apple Watch Series 4 can make an ECG similar to the kind you’d find in a hospital, at least according to the FDA. You can get started on your ECG reading by placing your finger on the Digital Crown for about 30 seconds. It’s important you wear the device while this is going on. The ECG and other heart data is stored in your paired iPhone’s Health app. The handset needs to be an iOS 12.1.1-running iPhone 5S or above. iOS 12.1.1 is in beta testing as well. Not everyone will get to check their ECG even if they fulfill all these criteria. The problem lies with regulation. Apple will only release it in countries where it gets cleared by the relevant authorities. The FDA gave the brand the green signal in the US, but other nations will probably take more time. 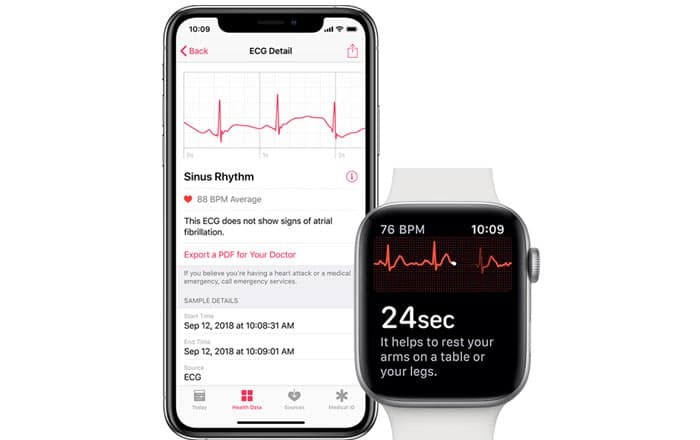 It seems Apple is telling its employees that the ECG app is not a diagnostic device and should not be utilized to track disease status or switch medications without consulting a doctor. Still, it should be useful for at-risk users who want to keep tabs on their heart health.